How to make sprouts at home may sound like a difficult technique, which requires lot of precision, but when you try it you’ll see it’s 1-2 minutes of activity each day. And it’s so much fun seeing your little sprout come to life and longer the sprouts grow more proud I feel. The whole process of sprouting turns legumes and grains into living plants with more vitamins, such as Vitamin C, B and carotene. It also helps the absorption of minerals. 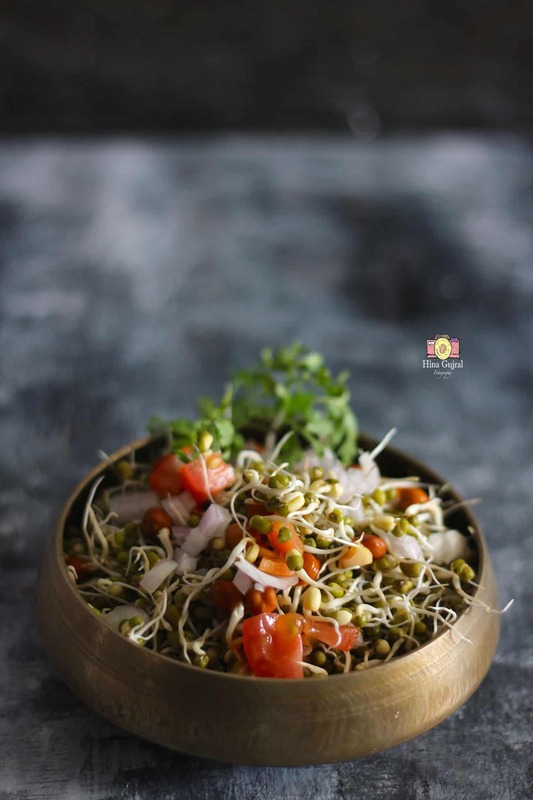 How sprout should be consumed is a debatable issue some say it should be consumed raw while others challenge the idea by saying sprouting encourages bacteria to grow so it’s best if sprouts are cooked to kill the bacteria. 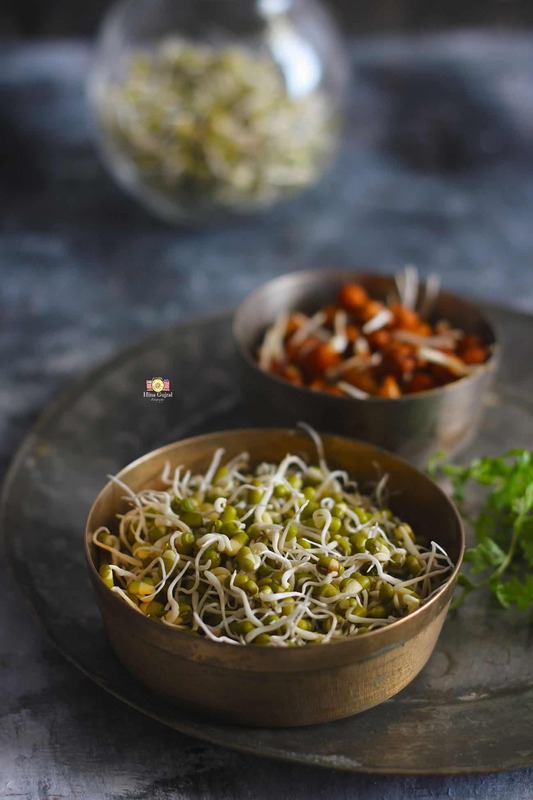 You can prefer either ways to consume sprouts, a fistful of sprouts can be added in your daily salad, upma, pulao or stir fry to lace it with additional protein. 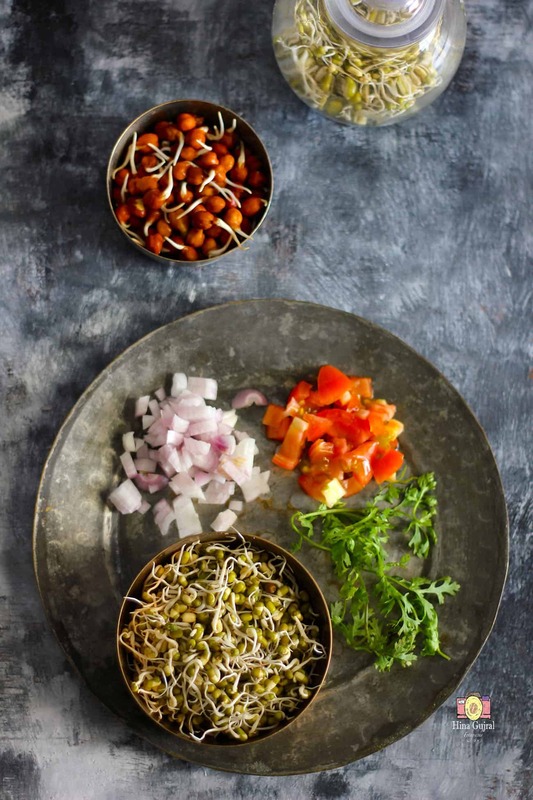 To make sprouts at home, wash the Green Moong Lentil or whatever pulse or seed you are using for sprouting. Soak the lentil in enough water overnight or for at least 5 – 6 hours. I usually prefer soaking the legume overnight. Next morning drain the legume in a metal colander and let it sit for 15 – 20 minutes, this way excess liquid is drained out of the legume. Now take a clean and dry muslin/cotton cloth or any breathable piece of cloth, spread the drained legumes in the muslin cloth, bring the corners together and tie into a loose knot. Now you can keep the piece of cloth with sprouts in a bowl to and store it in some dry and dark place undisturbed for 8 hours or overnight. The most preferred place for sprouting is inside the microwave or oven. In an alternative method, instead of using muslin cloth you can directly put sprouts in a container with a tight fitting lid. 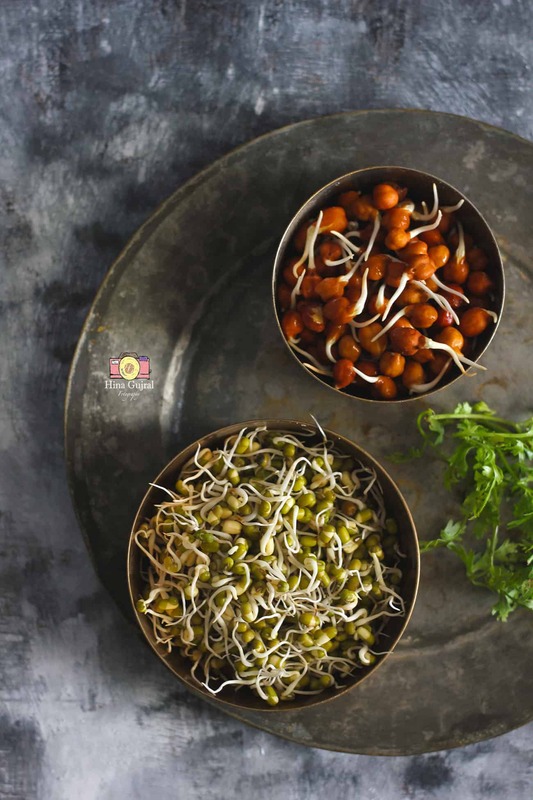 Each legume takes different amount of time for sprouting. I tried to make sprouts with Black Channa using the same above method and it took around 3 days completely for the sprout to come. If you like long sprouts then the whole process takes near-about 2 days. Such a gorgeous sprout salad! I love sprouts and I appreciate your presentation. Nice blog! 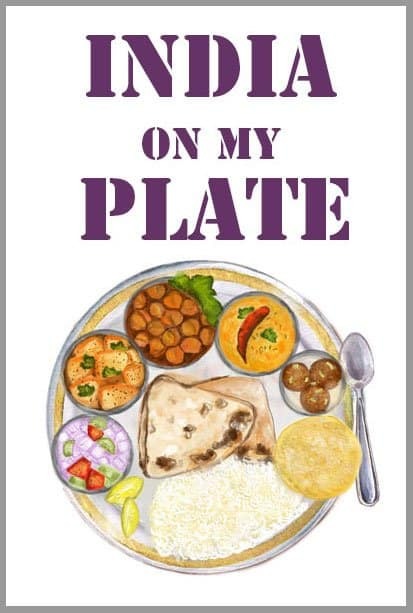 Yes agree with you Swati it tastes delicious and packed with so much nutrients. Totally in love with the pics! Hina, I olso tried d same way bt after keeping for a day….when I checked they were smelling really bad..& they were very sticky olso..? I had tried a few tymz mre…bt sme thng happens olways…!! Can u pls tel where I m wrong??? Hello Purvi, before putting lentils for sprouting in a bowl make sure they are moist but no excess water remain in the bowl or container in which your are going to sprout lentils. Second, if by next day they are smelling foul, you can rinse them with running water, drain and set again for sprouting. Third, usually keeping them inside the warm place like microwave or oven really helps sprouting faster. Hope this helps.